Jeremy Hermida’s first at-bat in the major leagues produced a grand slam. 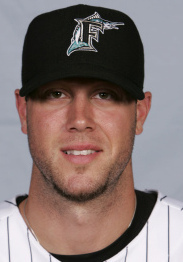 He was 21 at the time, and the Florida Marlins thought they had a player worthy of building a team around. That was five seasons ago. Yesterday, the Marlins grew tired of waiting and traded Hermida to the Red Sox for lefthanders Hunter Jones and Jose Alvarez. The Red Sox see Hermida as a suitable fourth outfielder who can fill the role Rocco Baldelli did this past season. But the lefthanded hitter, who turns 26 in January, remains capable of developing into an everyday player. Hermida hit .259 with 13 home runs and 47 RBIs for the Marlins this season, playing right and left field. But it was not long ago that much more was expected from him. The 11th overall pick in the 2002 draft, Hermida had 18 homers and drove in 63 runs during the 2007 season. An OPS of .956 over the second half of that season seemed to indicate the Georgia native was on the verge of stardom. But he has hit .253 since then, with a sharp decline in slugging percentage. With Hermida eligible for salary arbitration after earning $2.25 million in 2009, the budget-conscious Marlins were willing to accept a modest return. Jones, 25, had a 9.24 ERA in 11 games with the Red Sox this season. Alvarez is a 20-year-old who played Single A ball. Hermida believes a change of location will suit him and perhaps unlock the potential so many believe he has. “I was one of the older guys in Florida,’’ he said. “That’s the kind of team we had. Now I’ll be around guys who have been in the league for 10 or 11 years. I can learn a lot from there. At this point in my career, it’s probably the best thing for me. Hermida played only three games after Aug. 31 because of an oblique strain. But he did draw a career-best 56 walks, something not lost in the evaluation done by the Red Sox. Baldelli filed for free agency yesterday, as did reliever Billy Wagner and left fielder Jason Bay as baseball got down to business following the World Series. The Red Sox also opened room on their 40-man roster by outrighting righthander Fernando Cabrera, outfielder Joey Gathright, and infielder Nick Green to Triple A Pawtucket.